LightingShrink Landscape Lighting Connections Professional Anti Fire 609-923-9210. 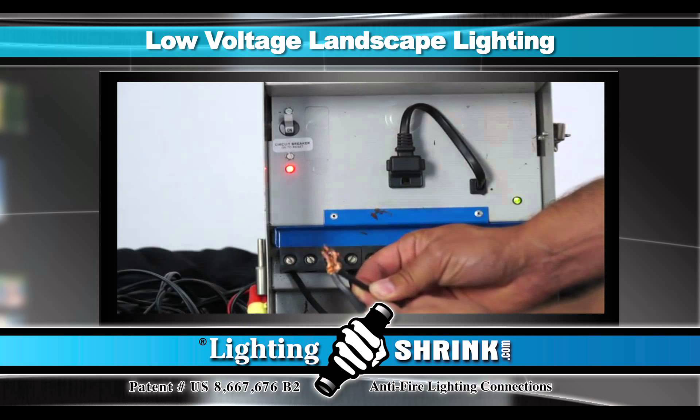 How Low Voltage Landscape Lighting Connections Melt and Burn Video! LightingShrink Anti-Fire Landscape Lighting Connectors solves the emerging problem of low voltage, Landscape & Garden lighting Connections from Melting and Burning. 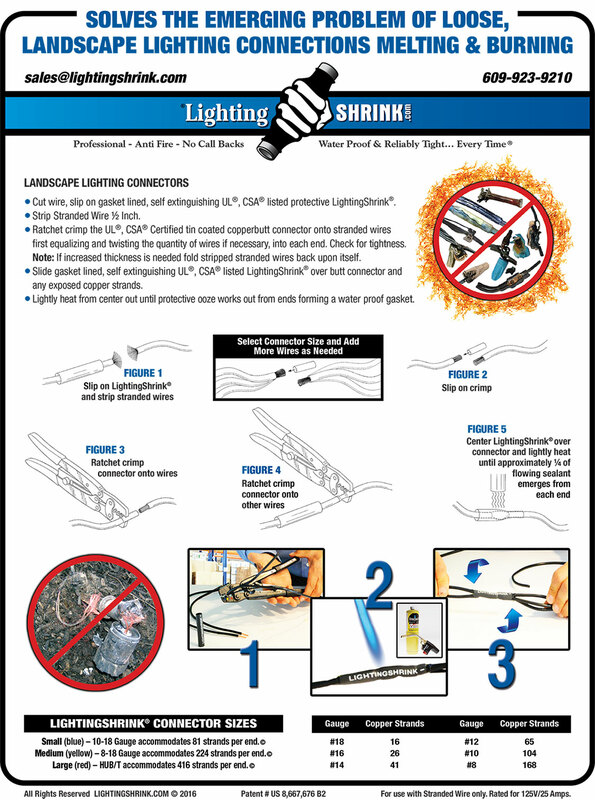 Using LightingShrink Anti-Fire Lighting Connections and its Process-Patented System with the Field-Tested LightingShrink-Ratcheting Crimping Tool and Proven Heat Shrink solves the emerging problem of burning lighting connections with fast, consistent and permanent connections. Are your lighting Design and installations starting to Melt and Burn? LightingShrink was developed as a solution to the emerging problem of loose, low voltage lighting connections that we found were starting to melt and burn over time. These problems occur even if the connections were initially thought to be installed tight. Low voltage Lighting connections become loose and melt and burn from tree roots, as surrounding plantings grow and become entangled or the trades pulling on wires making room for new plantings. Complications are also happening due to the Thermal Cycle (the fixture being turned off and on) causing expansion and contraction, as Lighting connections heat and cool over time, space is being created between the strands of copper wire causing arcing. The LightingShrink Process is a fast consistent way to make permanent direct burial connections. Our Process Patented, non releasing until tight, LightingShrink-Ratcheting Crimping Tool,with tin coated, copper barrel stranded wire splice connectors and proven heat shrink protection to be waterproof and reliably tight, every time! Small (blue) - 10-18 Gauge accommodates 81 strands per end. Medium (yellow) - 8-18 Gauge accommodates 224 strands per end. 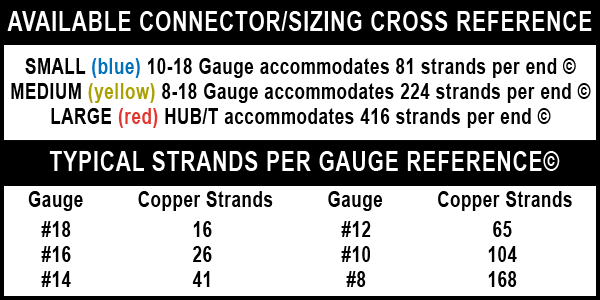 Large (red) - hub/t accommodates 416 strands per end.